In southern Utah, it takes a while for the summer heat to give way to fall weather. By mid-November, however, the temperature most days is as crisp as the autumn leaves that crunch so satisfyingly beneath your feet. Some people limit their fall and winter gardening activities to investing in the occasional potted chrysanthemum or poinsettia. While these add some spectacular seasonal color, our landscaping experts at Stonetree have a few more tips when it comes to caring for your St. George landscape this fall. One of the first things to do once fall has fallen is to start watering your landscape less. The Washington County Water Conservancy District suggests that starting this month, you only water once a week. When it comes to lawn care, the district recommends the cycle-and-soak method. This system involves running your sprinklers in three cycles about an hour apart. During each weekly watering, you want to run your sprinklers enough to put a half-inch of water on the ground. You can determine how long it takes for your sprinklers to do this by running a test. Place a container like a measuring pitcher or even a soup cans on the ground and turn on your sprinklers. Once you’ve learned how long it takes for your sprinklers to lay out a half-inch of water, divide this time period by three. If your sprinkler needs to run 21 minutes to distribute a half-inch of water, then each of your three sprinkler cycles should last 7 minutes. The time after each sprinkler cycle allows the water to soak into your grass rather than running off or evaporating. It should permeate 6 to 8 inches below the soil surface, helping your lawn develop a vigorous root system. If you, like many of your St. George neighbors, have embarked on a water-wise lifestyle, you’ll want to keep your eye on the sky. If it’s gusty, consider waiting until the following day to water because running your sprinklers when it’s windy promotes evaporation. You obviously don’t need to water on rainy days. Consider having your St. George landscaper install a rain switch that automatically halts watering during rainstorms, then turns irrigation back on once the soil is dry. In Southern Utah’s desert climate, spring bulbs will bloom in healthy profusion, but they have to be planted earlier than in many locations. Generally, it’s best to get them into the ground after Thanksgiving. If you buy flower bulbs and the weather is still warm, you can store them in a cool place like the fridge for up to 6 weeks. Just don’t place them next to vegetables as some emit a gas while ripening that’s harmful to bulbs. 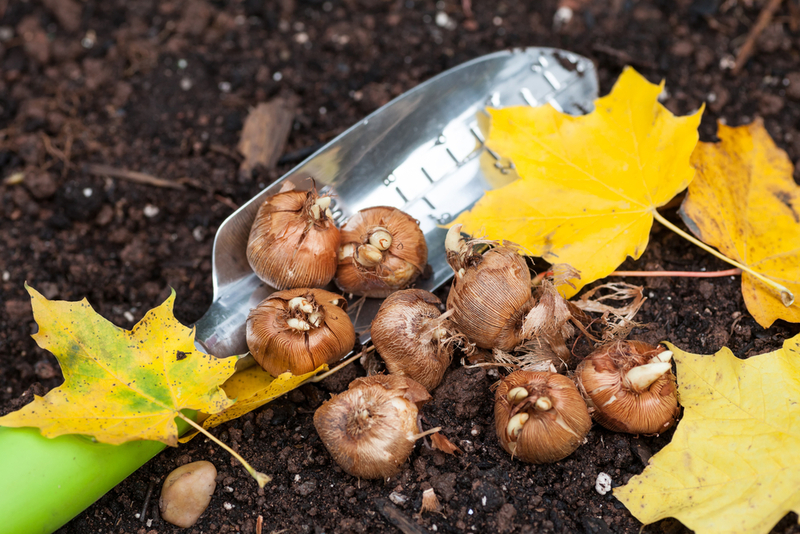 Get the bulbs into the garden the same day you remove them from the refrigerator, planting them at a depth of about three times the bulb height. This will keep them from being harmed by the occasional winter freeze, which rarely extends below an inch of the soil. You may also want to speak with your local landscaper or nursery employee about preparing for the best bulb growth. For instance, some bulbs should be planted right side up while others should be planted upside down. Your gardening expert may also advise you to take measures like adding a touch of starter fertilizer and organic material to the soil while planting and covering the planted bulb area with a couple inches of mulch. At Stonetree, we agree that having a beautiful and functional landscape makes for a better tomorrow. We invite you to contact us with any questions.